Whimsical apartment near Mole Antonelliana. Two bedroom apartment. Two bedroom apartment furnished in a modern style in downtown located in the center of the Turin nightlife near Po Street and Vittorio Veneto Square. Located on the 3rd floor with elevator access, in a Historical Building of the eighteenth century exposed an internal courtyard. Inside the unit features an entrance into the kitchen, sofa-bed, large bedroom and bathroom with shower and bath. - luggage storage on demand. We are waiting for you! We are sure that our city will amaze you! Upon your arrival we will be pleased to present you with a “Turin typical delight” and to provide you with tourist material filled with information that will help you navigate the city. Are you traveling with a group of friends and would prefer to stay together? No problem, we offer another apartment of similar style on the same floor: 'Turin White Classic Apartment'. For further information don’t hesitate to contact us. We will be more than happy to help you! Walk to dozens of tourist sites such as the Cinema Museum, Mole Antonelliana, Egyptian Museum, Gran Madre Church, Royal Palace, Regio Theater, Carignano Square, Castello Square, Duomo, Sacra Sindone, etc. In just a 5 minute walk you will be at Roma Street, Lagrange Street and Garibaldi Street: Turin’s preferred shopping destination. Many people recommend the restaurants in the “Murazzi” area (a meeting point for young and old alike) and the experience in the “Quadrilatero Romano” area will only add to your enjoyment. In about 3 blocks there is Po river, where you can walk on the riverside and if you desire, navigate the river by boat. 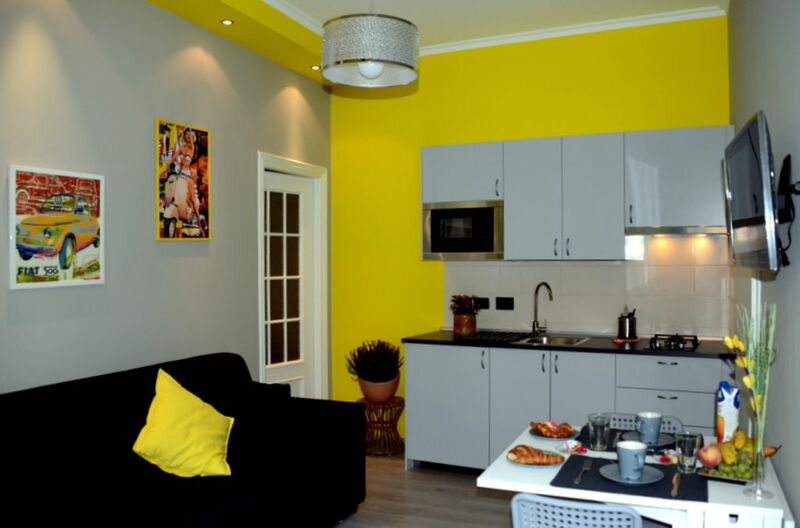 The apartment’s conveniently located in the city, with many of the area attractions in walking distance. You can also opt to rent a bicycle, “[TO]bike”. Less than a block away there is a city bus stop that offers transportation throughout the city of Turin. (We will provide a bus map of the city upon your arrival and available to assist you with any needs during your vacation with us). This apartment is in the middle of Turin! Great location. Claudia was the best host ever! Everythng you need is in the aparttment. Quiet. Cant wait to ome back. Turin Yellow Apartment met all our needs. Great location! In the middle of central Turin. Shopping, resturants, museums are all nearby. The very best part is Remicla is the best host. She went out of her way to make sure that we had everything we needed. Thank you! I would recommend this apartment 100% to anyone I know or don't know. The hospitality was unbeatable and location perfect. The access is a little difficult but it was comfortable and clean and will positioned. We had a great stay in Turin at Remicia's adorable apartment. She met us when we arrived to give us the keys and show us around. Her place is clean and comfortable. It is also located near restaurants and shopping. Remicia speaks English well and returned my emails quickly. It was perfect for my mom and I while we were visiting Italy!! Just what we needed for a one-night stop-over in Turin, being centrally located in the old part of this beautiful city. The appartment was quiet, clean, tidy and comfortable. We would recommend this for anyone looking for a central base. Remicla was very helpful in responding to our querries. The only negative was our inability to access wi-fi (which was stated as available) which did cause some difficulties. If we were staying any longer than one night this would have become an issue for us.